Last week there was excitement from Providence, Rhode Island community members over the fact that the City Council, in a preliminary vote, voted yes to pass The Community Safety Act (CSA), an act designed by community members to protect communities of color, and individuals, from acts of police racial profiling, and use of excessive force. 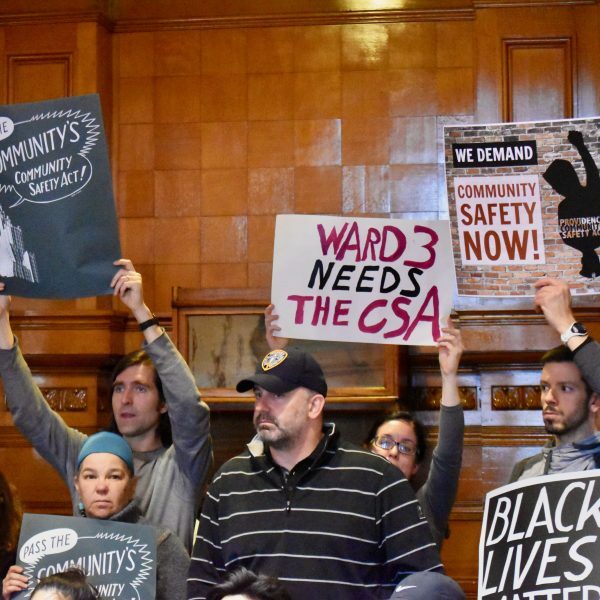 Three years in the making, the CSA, had the backing of Mayor Jorge Elorza, who said he would sign the bill into action once passed by the City Council. Last night, in what angered, and deeply upset those in support of the CSA, was the hedging of City Council members, believed to be both intimidated and pressured by the Police Department, and the Attorney General, who do not want to see the bill passed. The City Council voted to table the bill until June so that it can be reviewed once more. Please read the RI Future post for it’s excellent coverage of the City Council meeting. I am not surprised by the snippets of conversation I have heard this week in my workplace by some people who see this as a divisive, if you are for the CSA, you are against cops, matter. “I heard the mayor is passing a bill so that police can’t ask for identification if they have probable cause to stop a vehicle…” and “stay out of Providence..it’s not going to be safe anymore…” There is also an on-line article floating around on social media written by a police organization on how the “mayor is allowing criminal and thugs to have free reign over the city..” Not surprised anymore about the ways people flip the script, and would rather perpetuate racist policing policies, instead of seeing the horrific impact racism has on community of colors and policing, or understand the mission of the CSA to give equal, dignified, respectful protection to all of our city’s citizens, and to build positive police and community member relationships. The relationship between police and communities of color have been doomed to fail given the systems of white supremacy that created segregated low-income neighborhoods through discriminatory housing laws, and have created and perpetuated myths of these neighborhoods as filled with drug dealers, thugs, and gang members. If only we looked at the conditions that have blocked individuals in these communities from having access to safe housing, quality public schools, employment opportunities, and opportunities to build wealth, then we’d see how important it is to change the way policing happens in these neighborhoods. Then we’d see just how badly we need the Community Safety Act to pass. Thank you, again, Steve Ahlquist, over at RI Future for this coverage of last night’s City Council meeting. Thx so much for writing this Wendy. It’s heartbreaking and I imagine you had to take to your pen and as a writer express yourself– I’m most appreciative. The police profiling (such a sanitized term for the many forms of violence it encompasses) happens on the East Side too, amidst wealthy white families when black and mixed and multi-racial families dare trespass into those white communities. It’s a plague all too familiar. The assertions of the fear mongering tactics of the police union are business as usual, the ugly artifice of white supremacy spreading its lies to itself and the gullible. I hope I’m around to add my voice at the next public hearing. Thanks again–I look forward to being in the stands for the next meeting, too! Hello, there, Diana! I so love your very heart and spirit and so hope and wish that you can make it to the next meeting, sister! Sisterfriend, your very commitment just does my very heart and spirit such great good, Diana! Wow!!!! Yay!!!!! Well, hello, there, Wendy Jane, my so, so very For Always awesomely precious and dearly special soul sisterfriend and my and our absolutely undaunted white anti-racist woman, ally, writer, and advocate in the great spirit of unity and solidarity!!!! Wow!!!! Yay!!!! Sister, I can just feel your so, so very precious heart and spirit, and I can feel your deep love here for us as black persons and as other oppressed peoples, sisterfriend. Sister, I can feel how you put all that you have with all of your very being into this beautiful, absolutely beautiful, heartfelt, lovingly caring, and sensitive blog post article in such a very diligent and conscientious manner, my and our sweet friend!!!! I can tell how you put your whole heart and spirit out on the lines for all of us like with us as the black persons you so love and cherish, sister!!!! You tried so, so very hard to get your Council person to do the right thing and to take action, positive, productively proactive action in voting to approve the very empowering CSA. You did all that you could, sister, and you did your absolutely very best, sisterfriend!!!!! YOU, Wendy Jane, and your so, so very dear and precious heart and spirit bearing witness to how you are reaching out and trying in being an anti-racist ally and how as you have always done so much that you are doing even more and more and widening the scope of your anti-racist action and awareness, Wendy Jane. Sister, you help me to cope and to just keep on keeping on in keeping my very faith and hope alive with my positive optimism, sister!!!! I have been feeling so sad and overwhelmed by yet again another precious black person, and a young person at that, being killed by the police like with our so very dear Jordan Edwards, sister and friend of mine, Wendy Jane! I am feeling so overwhelmed and thinking and praying, “Not again!!!!! Not again!!!! !” My sweet white sister Wendy Jane, it is so, so very right on, wondrously wonderful white women like YOU, dear, dearest precious Wendy Jane who just keep me from ever giving up and losing heart, and YOU help me and all of your other black sisterfriends and brotherfriends to keep our very faith and hope alive, to stay encouraged, emboldened, inspired, and uplifted, sister!!!!! YOU, Wendy Jane, are our very joy and blessing, my and our absolutely fantastic sister and friend!!!!!!! I thank God for having YOU as my so, so very dearest sister and friend, and as my anti-racist ally and advocate, sisterfriend!!!! Wow!!!!! Yay!!!!! YAY for YOU, Wendy Jane!!!!! YAY!!!!! Thank-you so, so much!!!! Just joyfully reading this very powerful blog post article here and joyously responding with my very heartfelt, detailed, and thorough thoughts, ideas, and comments help me greatly and immensely bless me in keeping my courage and in keeping up the good fight even with these vast atrocities and killings against black people contining to happen, sisterfriend. Thank-YOU so, so much, Wendy Jane!!!!! Sister, the title of this awesome blog post article here is just perfect, absolutely perfect, and even more so with the very poignant picture complementing and accompanying it, Wendy Jane! Wow, sister, I thank-YOU for this great link with this very insightful article which you have very graciously and generously featured and included with your very fine and excellent article here. I am so enjoying reading through this with its great and rich details, my so, so very dearest and darling friend! Sister, I know what you mean about the Council being manipulated and intimidated by the police. Wow, sisterfriend, I am just infuriated along with you, Wendy Jane, and I for sure know what you mean when a city and community doesn’t do its job in not doing the right thing! Sister, you are so, so very incredibly brave to have to bear some of the insensitive comments by some people who are against the CSA, Wendy Jane! I know that that cannot be easy, sister!!!!!! I so appreciate Steve Ahlquist for his extensively thorough coverage of the City Council meeting. Wow, Wendy Jane, you have just masterfully and brilliantly composed in the written word such a very outstanding and engaging blog post article here!!!!! I am moved to being teary-eyed and so moved and touched in my very, very heart, and in my very, very heart, mind, soul, and spirit by your passion made very evident in this very fine and excellent blog post article, and in your so, so very dear and precious love for us as black people with your indomitable anti-racism, awareness, and greatly positive and productively proactive activism!!!! I thank-YOU so, so much, my and our sweet white sister and friend, Wendy Jane!!!!! And I am YOUR ally, too, your Christian ally my and our sweet Jewish sisterfriend because the vile ugliness of antisemitism with oppression, hate, and discrimination is very much alive and well, and you can count on me and I have your back, too, and I am your Christian ally, my so, so very absolutely awesome Jewish sisterfriend!!!! I love you so, so very much, Wendy Jane!!!!!! :)!!!!!! Please have such a totally terrific and a very thrilling Thursday and may all of your very days be so, so very especially blessed!!!! I just cannot wait and am bursting with such very delightfully eager anticipation to write all of my responses to you and to this stupendous blog post article the way I usually do as soon as I am at my computer more often and at home more often!!!! I love you a whole bunch, Wendy Jane!!!!!:)!!!!! Thank you, Sherry, for reading! And for all of your support! I truly appreciate it, I truly do.